Bernard Edward Tathwell White was born on 23 November 1903 in 27 Carlton Road, Putney, London. He was the son of Bernard Joseph White and Daisy Dora Dyer. Bernard Edward Tathwell White died circa August 1906 in Putney, London. Bernard Joseph White was born on 5 February 1857 in 26 Great Russell Street, North St Giles, Middlesex. He was the son of George White and Lavinia Tathwell. Bernard was recorded in the census of 7 April 1861 living in 16 Bartholomew Road, Kentish Town, Middlesex. He was enumerated as Bernard White, son of George White, age 4, scholar, born in London, Middlesex. Bernard was recorded in the census of 2 April 1871 living in 14 Kempsford Gardens, Kensington, Middlesex. He was enumerated as Bernard White, son of George White, unmarried, age 14, clerk to warehouseman, born in St George's Bloomsbury, London. He lived in Putney, Surrey, on 15 March 1881. He was a mercantile clerk on 15 March 1881. He married Matilda Mary Jones, daughter of Thomas Jones, on 15 March 1881 in Parish Church, Putney, Surrey. Bernard was recorded in the census of 3 April 1881 living in 10 Percy Road, Fulham, Middlesex. He was enumerated as Bernard J White, head of household, married, age 23, mercantile clerk, born in Bloomsbury, Middlesex. He was a estate agent on 26 November 1881. He was a fancy warehouseman on 23 June 1885. He was a commission agent on 31 May 1886. Bernard was recorded in the census of 5 April 1891 living in 12 Grimston Road, Fulham, London. He was enumerated as Bernard White, head of household, married, age 34, stockbroker's clerk, employed, born in Bloomsbury, London. He and Matilda Mary White lived in 152 Hurlingham Road, Fulham, London, on 12 May 1900. Bernard Joseph White was a secretary to a public company on 12 May 1900. He was the official informant of the death of Matilda Mary White on 12 May 1900 in 152 Hurlingham Road, Fulham. Bernard was recorded in the census of 31 March 1901 living in 152 Hurlingham Road, Fulham. He was enumerated as Bernard Jos White, head of household, widower, age 44, secretary to public company, worker, born in Bloomsbury. He and Daisy Dora Dyer lived in 152 Hurlingham Road, Fulham, on 16 November 1901. Bernard Joseph White married Daisy Dora Dyer, daughter of Robert Edward Hanbury Pettingal Dyer, on 16 November 1901 in The Register Office, Fulham, London. Bernard was recorded in the census of 2 April 1911 living in 41 Frithville Gardens, Shepherds Bush, London. He was enumerated as Bernard White, head of household, age 54, married, chartered secretary, born in Bloomsbury, Middlesex. He was a retired company secretary on 30 December 1946. He died on 30 December 1946 in Lister Hospital, Hitchin, Hertfordshire, at age 89. Bernard died of intestinal obstruction and strangulated inguinal hernia. Bertha White was born before 8 April 1859 in Kentish Town, Middlesex. She was the daughter of George White and Lavinia Tathwell. Bertha was recorded in the census of 7 April 1861 living in 16 Bartholomew Road, Kentish Town, Middlesex. She was enumerated as Bertha White, daughter of George White, age 2, born in Kentish Town, Middlesex. Cecil Ambrose White was born on 7 December 1882 in 18 Gloucester Place, Hyde Park, Paddington, Middlesex. He was the son of Stephen White and Rebecca Marie Tussaud. Cecil was recorded in the census of 5 April 1891 living in Oakwood House, Crayford, Kent. He was enumerated as Cecil A White, son of Stephen White, single, age 8, scholar, born in Paddington, London. Cecil was recorded in the census of 31 March 1901 living in Oakwood, Crayford, Kent. He was enumerated as Cecil A White, son of Stephen White, single, age 18, born in London, Middlesex. Cecil was recorded in the census of 2 April 1911 living in Oakwood, Crayford. He was enumerated as Cecil A White, brother of Stephen Joseph White, age 26, single, born in London. He died on 14 September 1960 at age 77. Cecilia White was born on 25 October 1835. She was the daughter of Stephen White and Jane Ann Wakeling. Cecilia was recorded in the census of 6 June 1841 living in 1 Lambs Conduit Street, Holborn, Middlesex. She was enumerated as Cecilia White, age 9, born in Middlesex. Cecilia was recorded in the census of 30 March 1851 living in 21 Gloucester Place, Chelsea, Middlesex. She was enumerated as Cilea White, daughter of Stephen White, unmarried, age 15, born in Lamb Conduit Street, Middlesex. Cecilia was recorded in the census of 7 April 1861 living in 73 Theobalds Road, Finsbury, London. She was enumerated as Cecilia White, daughter of Stephen White, unmarried, age 25, born in St. Andrew, Middlesex. Cecilia was recorded in the census of 2 April 1871 living in 92 Talbot Road, Paddington, Middlesex. She was enumerated as Cecilia White, daughter of Stephen White, ummarried, age 35, born in Holborn, London. Cecilia was recorded in the census of 3 April 1881 living in 2 and 3 Colville Houses Boarding House, Kensington, Middlesex. She was enumerated as Cecilia White, sister of Frances White, unmarried, age 44, boarding house keeper, born in London, Middlesex. Cecilia was recorded in the census of 5 April 1891 living in Chelmsford Villa, Victoria Road, Romford, Essex. She was enumerated as Cecilia White, sister of Frances White, single, age 55, living on her own means, born in St George the Martyr, London. Cecilia was recorded in the census of 31 March 1901 living in 20 Matham Grove, Camberwell, London. She was enumerated as Cecilia White, sister of Francis White, single, age 65, living on own means, born in London. Cecilia was recorded in the census of 2 April 1911 living in 41 Princes Road, Wimbledon, Surrey. She was enumerated as Cecilia White, sister of Emily Stock, age 76, single, born in Holborn. She died on 11 February 1913 at age 77. Charles White was born on 29 May 1833. He was the son of Edward White and Susannah Bird. Charles was recorded in the census of 6 June 1841 living in 73 Lambs Conduit Street, Holborn, Middlesex. He was enumerated as Charles White, age 9, born in Middlesex. Charles was recorded in the census of 30 March 1851 living in 73 Lambs Conduit Street, Holborn. He was enumerated as Chas White, son of Edward White, unmarried, age 17, architect, born in parish of St. George the Martyr, Middlesex. He died on 5 August 1857 at age 24. 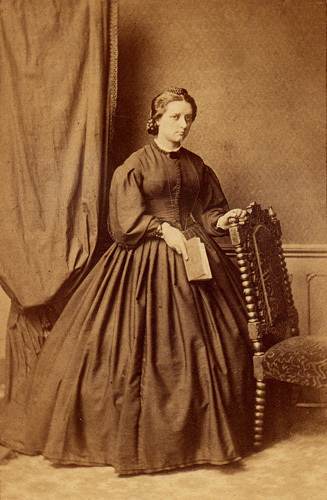 Charlotte Ann White was born before 4 October 1831 in Hoxton, Middlesex. She was the daughter of James Thomas Westbrook White. 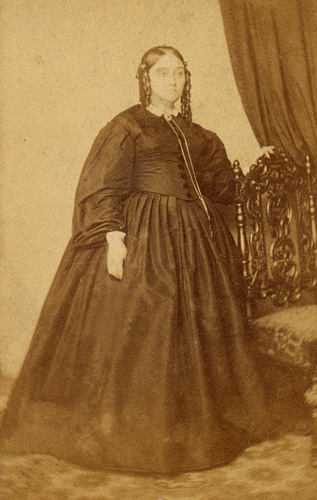 Charlotte Ann White lived in 15 St Leonards Road, Bromley, Middlesex, on 3 October 1852. She married Henry Charles Mower, son of Henry Mower and Caroline Hicks, on 3 October 1852 in Bromley St Leonard Parish Church, Bromley, Middlesex. As of 3 October 1852 her married name was Mower. Charlotte was recorded in the census of 7 April 1861 living in Marylebone Lane, Marylebone, Middlesex. She was enumerated as Charlotte A Mower, wife of Henry Mower, married, age 26, born in Hoxton, Middlesex. Charlotte was recorded in the census of 2 April 1871 living in 6 Brunswick Cottages, Grove Road, Hammersmith, London. She was enumerated as Charlotte Mower, wife of Henry Mower, married, age 36, born in Hoxton, Middlesex. Edward White was a surgeon. He was born on 10 February 1790 in Brailes, Warwickshire. He was the son of George White and Mary (?). Edward White married Susannah Bird on 10 January 1813 in Christ Church Greyfriars, Newgate Street, London. Edward was recorded in the census of 6 June 1841 living in 73 Lambs Conduit Street, Holborn, Middlesex. He was enumerated as Edward White, age 50, surgeon, not born in Middlesex. Edward was recorded in the census of 30 March 1851 living in 73 Lambs Conduit Street, Holborn. He was enumerated as Edward White, head of household, married, age 61, surgeon general practitioner, born in Warwickshire. He witnessed the marriage of George White and Lavinia Tathwell on 3 April 1856 in St Aloysius Chapel, Somers Town, London. Edward was recorded in the census of 7 April 1861 living in 73 Lambs Conduit Street, Holborn. He was enumerated as Edward White, head of household, married, age 71, surgeon, born in Brailes, Warwickshire. He died on 9 August 1863 in 73 Lambs Conduit Street, Holborn, at age 73. Edward died of senile decay and gangrene of foot. Edward White was born on 18 September 1830. He was the son of Edward White and Susannah Bird. Edward was recorded in the census of 6 June 1841 living in 73 Lambs Conduit Street, Holborn, Middlesex. He was enumerated as Edward White, age 10, born in Middlesex. Edward was recorded in the census of 30 March 1851 living in 73 Lambs Conduit Street, Holborn. He was enumerated as Edward White, son of Edward White, unmarried, age 19, commercial clerk, born in parish of St. George the Martyr, Middlesex. He died on 22 June 1909 at age 78. Elizabeth White was born on 12 March 1797 in Brailes, Warwickshire. She was the daughter of George White and Mary (?). Elizabeth was recorded in the census of 6 June 1841 living in High Street, Brailes, Warwickshire. She was enumerated as Elizabeth White, age 40, born in Warwickshire. Elizabeth was recorded in the census of 30 March 1851 living in Brailes. She was enumerated as Elizabeth White, head of household, unmarried, age 54, seamstress, born in Brailes, Warwickshire. Elizabeth was recorded in the census of 7 April 1861 living in Brailes. She was enumerated as Elizabeth White, head of household, unmarried, age 64, annuitant, born in Brailes, Warwickshire. She died on 4 January 1866 at age 68. Elizabeth Laura White was born on 23 December 1865 in Bellevue House, Kentish Town, Middlesex. She was the daughter of George White and Lavinia Tathwell. Elizabeth was recorded in the census of 3 April 1881 living in 233 Brompton Road, Kensington, Middlesex. She was enumerated as Elizabeth White, daughter of George White, age 15, scholar, born in St Pancras, Middlesex. She was the official informant of the death of George White on 10 December 1898 in 10 The Retreat, Kenninghall Road, Clapton, London. Elizabeth Laura White lived in 10 The Retreat, Kenninghall Road, Clapton, on 10 December 1898. She was the official informant of the death of Lavinia White on 30 April 1910 in St Joseph's Hospice, Mare Street, Hackney, London. Elizabeth Laura White lived in 41 Edith Grove, Fulham, London, on 30 April 1910. Emily White was born on 24 August 1843 in Holborn, Middlesex. She was the daughter of Stephen White and Jane Ann Wakeling. Emily was recorded in the census of 30 March 1851 living in 21 Gloucester Place, Chelsea, Middlesex. She was enumerated as Emily White, daughter of Stephen White, unmarried, age 7, born in Lamb Conduit Street, Middlesex. Emily was recorded in the census of 7 April 1861 living in 73 Theobalds Road, Finsbury, London. She was enumerated as Emily White, daughter of Stephen White, unmarried, age 17, born in St. Andrew, Middlesex. She lived in 26 Ledbury Road, Bayswater, Middlesex, on 7 April 1866. As of 7 April 1866 her married name was Stock. She married Charles Rankin Stock, son of Charles Stock and Rebecca Rankin, on 7 April 1866 in Kensington Catholic Chapel, Kensington, Middlesex. Emily was recorded in the census of 2 April 1871 living in 15 Leamington Road Villas, Paddington, Middlesex. She was enumerated as Emily Stock, wife of Charles R Stock, married, age 27, born in St. Pancras, Middlesex. Emily was recorded in the census of 3 April 1881 living in Gower House, St Mary's Road, Ealing, Middlesex. She was enumerated as Emily Stock, wife of Chas R Stock, married, age 36, born in London. Emily was recorded in the census of 5 April 1891 living in 30 Radipole Road, Fulham, London. She was enumerated as Emily Stock, head of household, widow, age 45, living on her own means, born in London. Emily was recorded in the census of 31 March 1901 living in 46 East Dulwich Grove, Camberwell, London. She was enumerated as Emily Stock, head of household, widow, age 57, living on own means, born in Holborn, London. Emily was recorded in the census of 2 April 1911 living in 41 Princes Road, Wimbledon, Surrey. She was enumerated as Emily Stock, head of household, age 67, widow, married 44 years, 7 children 5 still living and 2 who have died, born in Holborn. She died on 25 November 1932 in 59 Kensington Hall Gardens, Fulham, London, at age 89. Emily died of cardiac failure, bronchitis & arterio-sclerosis. Ethel Lavinia Mabel Tathwell White was born on 26 November 1881 in Victoria Villa, Victoria Road, Putney, Surrey. She was the daughter of Bernard Joseph White and Matilda Mary Jones. Ethel Lavinia Mabel Tathwell White was the official informant of the death of Bernard Joseph White on 30 December 1946 in Lister Hospital, Hitchin, Hertfordshire. Frances White was born on 31 August 1833. She was the daughter of Stephen White and Jane Ann Wakeling. Frances was recorded in the census of 6 June 1841 living in 1 Lambs Conduit Street, Holborn, Middlesex. She was enumerated as Frances White, age 11, born in Middlesex. Frances was recorded in the census of 30 March 1851 living in 21 Gloucester Place, Chelsea, Middlesex. She was enumerated as Frances White, daughter of Stephen White, unmarried, age 17, born in Lamb Conduit Street, Middlesex. Frances was recorded in the census of 7 April 1861 living in 73 Theobalds Road, Finsbury, London. She was enumerated as Fanny White, daughter of Stephen White, unmarried, age 27, born in St. Andrew, Middlesex. Frances was recorded in the census of 2 April 1871 living in 92 Talbot Road, Paddington, Middlesex. She was enumerated as Frances White, daughter of Stephen White, ummarried, age 37, born in Holborn, London. She lived in 3 Colville Square North, Kensington, Middlesex, on 8 February 1874. She was the official informant of the death of Eliza Elizabeth White on 8 February 1874 in 133 New Bond Street, London, Middlesex. Frances was recorded in the census of 3 April 1881 living in 2 and 3 Colville Houses Boarding House, Kensington, Middlesex. She was enumerated as Frances White, head of household, unmarried, age 48, boarding house keeper, born in London, Middlesex. She was the official informant of the death of Charles Rankin Stock on 9 April 1884 in 14 Highlever Road, Kensington, Middlesex. Frances White lived in 8 Triangle, Highlever Road, Kensington, Middlesex, on 9 April 1884. Frances was recorded in the census of 5 April 1891 living in Chelmsford Villa, Victoria Road, Romford, Essex. She was enumerated as Frances White, head of household, single, age 57, living on her own means, born in St George the Martyr, London. Frances was recorded in the census of 31 March 1901 living in 20 Matham Grove, Camberwell, London. She was enumerated as Francis White, head of household, single, age 67, living on own means, born in London. She died on 16 June 1901 at age 67. Francis Hyler White was born circa February 1903 in Croydon, Surrey. He was the son of Thomas Hyler White and Florence Ada Croney. Francis was recorded in the census of 2 April 1911 living in 2 Canterbury Road, Croydon, Surrey. He was enumerated as Francis Hyler White, son of Thomas Hyler White, age 8, born in Croydon, Surrey. Frederick Bernard Tathwell White was born on 31 May 1886 in 99 High Street, Putney, Surrey. He was the son of Bernard Joseph White and Matilda Mary Jones. Frederick was recorded in the census of 5 April 1891 living in 12 Grimston Road, Fulham, London. He was enumerated as Frdck B White, son of Bernard White, single, age 4, scholar, born in Putney, Surrey. Frederick was recorded in the census of 31 March 1901 living in 152 Hurlingham Road, Fulham, London. He was enumerated as Fredk Bern'd White, son of Bernard Jos White, single, age 14, born in Putney. George White was a cordwainer. He was born on 10 June 1747. He married Mary (?). George White married Catharine Morris on 5 February 1804 in St Mary, Marylebone Road, Marylebone, Middlesex. George White died on 5 November 1821 at age 74. George White was born on 21 April 1823. He was the son of Edward White and Susannah Bird. George was recorded in the census of 30 March 1851 living in 73 Lambs Conduit Street, Holborn, Middlesex. He was enumerated as George White, son of Edward White, unmarried, age 27, tutor, born in parish of St. George the Martyr, Middlesex. He lived in 21 Stanhope Street, Somers Town, London, on 3 April 1856. He was a bookseller on 3 April 1856. He married Lavinia Tathwell, daughter of Henry John Tathwell, on 3 April 1856 in St Aloysius Chapel, Somers Town, London. George was recorded in the census of 7 April 1861 living in 16 Bartholomew Road, Kentish Town, Middlesex. He was enumerated as George White, head of household, married, age 35, schoolmaster, born in London, Middlesex. He was a member of the Royal College of Preceptors on 23 December 1865. George was recorded in the census of 2 April 1871 living in 14 Kempsford Gardens, Kensington, Middlesex. He was enumerated as George White, head of household, married, age 47, professor of languages, born in St George's Bloomsbury, London. He was a professor of foreign languages on 15 March 1881. George was recorded in the census of 3 April 1881 living in 233 Brompton Road, Kensington, Middlesex. He was enumerated as George White, head of household, married, age 58, professor of languages, born in London, Middlesex. George was recorded in the census of 5 April 1891 living in St Scholastica's Retreat, 10 Kenninghall Road, Clapton, London. He was enumerated as George White, head of household, married, age 68, retired professor of languages, born in St Georges Queen Square, London. He was a private tutor on 10 December 1898. He died on 10 December 1898 in 10 The Retreat, Kenninghall Road, Clapton, London, at age 75. George died of acute bronchitis (14 days) and cardiac failure. Gladys Lilian Tathwell White was born on 23 June 1885 in 1 Crookham Road, Fulham, Middlesex. She was the daughter of Bernard Joseph White and Matilda Mary Jones. Gladys was recorded in the census of 5 April 1891 living in 12 Grimston Road, Fulham, London. She was enumerated as Gladys L White, daughter of Bernard White, single, age 5, scholar, born in Fulham, London. Gladys was recorded in the census of 31 March 1901 living in Corner House, Chobham Road, Horsell, Surrey. She was enumerated as Gladys White, boarder with Mary T Crawley, single, age 15, school boarder, born in Fulham, London. Gwendolyn Mary White was born on 14 April 1890 in "Oakwood", Crayford, Kent. She was the daughter of Stephen White and Rebecca Marie Tussaud. Gwendolyn was recorded in the census of 5 April 1891 living in Oakwood House, Crayford, Kent. She was enumerated as Gwendoline M White, daughter of Stephen White, single, age 11 months, born in Crayford, Kent. Gwendolyn was recorded in the census of 31 March 1901 living in Oakwood, Crayford, Kent. She was enumerated as Gwendolyn M White, daughter of Stephen White, age 10, born in Crayford, Kent. Gwendolyn was recorded in the census of 2 April 1911 living in Oakwood, Crayford. She was enumerated as Gwendolyn M White, sister of Stephen Joseph White, age 20, single, born in Crayford, Kent. She witnessed the marriage of Stephen Joseph White and Marguerite Smith on 28 August 1912 in St James Church, Spanish Place, Manchester Square, St. Marylebone, London. Gwendolyn Mary White lived in "Cleeve", Crowborough Hill, Crowborough, Sussex, on 16 December 1974. She died on 16 December 1974 in Ivy Hall Nursing Home, Crowborough, Sussex, at age 84. Gwendolyn died of cerebral thrombosis & atherosclerosis.